EastEnders fans have a juicy storyline to look forward to when Kathy Beale makes her full-time return – her comeback scenes have been filmed with menacing ex-husband Gavin Sullivan. 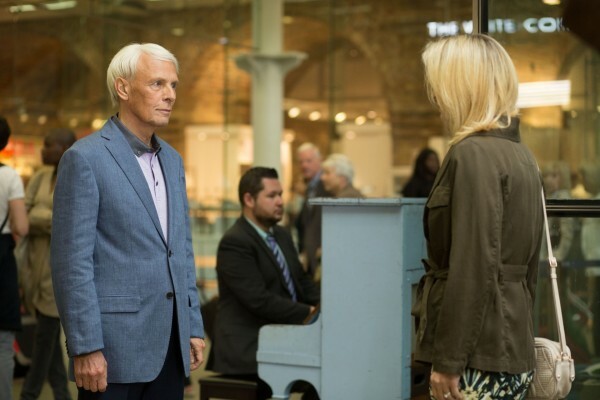 New pictures show Gillian Taylforth, who plays Kathy, and Paul Nicholas, cast as Gavin, shooting at London King’s Cross St Pancras station – and from the looks of things, Gavin will make Kathy’s return to Walford anything but smooth. Viewers saw Kathy seemingly return from the dead during the BBC soap’s live week, when she reappeared to speak to Phil Mitchell (Steve McFadden) despite apparently having died off screen years earlier. Kathy looks terrified of her ex Gavin in the station scenes, and possibly with good reason, as he’s said to know where many of Albert Square’s bodies are buried. Gavin is set to follow Kathy to her old home when she goes into hiding with ex Phil. Executive producer Dominic Treadwell-Collins added that he was pleased to have signed the former pop star and Just Good Friends actor. He said: “We are all thrilled. So many viewers have grown up with Paul so it’s brilliant to have him back on our screens.